Yard sales (or their smaller cousins, garage sales) are a way of life for many of us. Sure, you can find some needed tidbits or even a great deal on something you've been thinking of purchasing for your family, but they're more than that. Yard sales, especially community-wide ones, are an opportunity for much-needed social interaction. They're a great way to meet your neighbors, catch up on community events or activities and even keep the community tightly-woven. Nevertheless, many communities still restrict multi-family and sometimes even single-family garage sales. Sometimes out of fear that they'll bring in unwanted attention from those outside the community or simply that they'll lessen the aesthetic ambiance of the community itself. Of course, there are ways to skirt this (namely through appointment-style visits arranged through free online services like Craigslist). But let's look at how to get to the root of the problem and bring the community together in ways everyone can benefit from. Keep in mind that most of the time, HOAs or those that have a say in such things are primarily focused on the longterm ROI of the community's home investments (as well as maintaining a cultural track for the neighborhood). There's always political bickering, but there's not much you can do about that. That all said, the best way to get support for your organized event is to get organized. Demonstrating that you're concerned about the well being of your community and that you're willing to take on all of the work yourself will go a long way towards getting buy-in from the hardliners. It may not flip them, but it could open doors that might have seemed painted shut before. 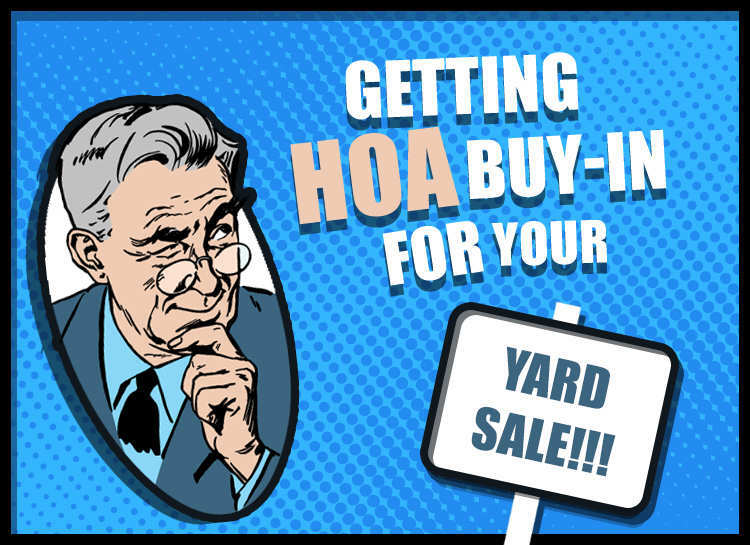 Start by checking your HOA's covenants to determine if the subject of yard/garage sales is mentioned. Sometimes, even if the HOA prohibits them, it will nevertheless support an annual garage sale involving everyone together. Whether they're permitted in your neighborhood or not, it wouldn't hurt to get a feel for the community's enthusiasm. Poll your neighbors – if a large group supports the idea, it will be much easier to get the board to agree (or even invest some additional resources into). You might have more luck making the case that a community event done well can help bolster the neighborhood's reputation (and potentially home values) in the region. Think kids, lemonade and comradery (okay, maybe that's a bit much for most, but just imagine the possibilities). If you don't have a community board of any sort, you can contact your local authority – this could be your city, town or county government – and find out if you need a permit for a large garage sale. Ask what requirements you will need to meet to obtain a permit. Ask about signage - where you can have them up during the event (as well as how long before and after). Sometimes, there may be a cost for the permit, so be sure to do your homework and ask a lot of questions. Community garage sales are usually organized in one of two ways. Either each homeowner sets up their sale items at their own home, or all the homeowners bring their items to a central location. Keep in mind that your HOA or local authority may make that decision for you. If you have the choice, you'll need to look at the pros and cons for each approach. If your neighborhood has a large common area, you may want to consider a central location. Buyers enjoy community sales because they don’t need to drive between sale areas. If your neighborhood is spread out, a central area may attract more buyers. In addition, each participant would more likely get equal attention. If each family sets up sale items at their own home, some sales may get less traffic than others. Yard sales are most popular in the spring or early summer because of the chance for a sunny day, but you may want to have a fallback weekend or two. This would allow you to have a coordinated and agreed-upon set of dates in case of inclement weather. Most successful sales are held on the weekend while buyers have the free time to browse, so plan for the weekend if possible and try to start early/end late. Start advertising the sale a few weeks before (you want to give the word a chance to spread from sign to word of mouth). Publish notices in your local paper, at online resources like Craigslist, the community calendar/website if you have one as well as any social media sites your neighborhood maintains (Facebook, Twitter, etc.). Be sure to get your neighbors, friends and family to spread the word out to their own social media networks - not to just "like the event," but to reshare it on their timeline (so that others outside their immediate network can see). Prepare yard signs that you can set up a day or so before the sale. Keep track of where you put them, you'll be scratching your head if you have 10 signs across town that you placed a few days earlier. Make sure that you aren’t breaking any sign laws before you choose the locations. Permits or restrictions may prevent signs from staying up too long and you can actually be fined pretty hefty amounts for each sign that is placed too early or that stays up too late after the event. Of course, signs need to be readable from a moving car at a distance. It’s critical that you use a thick marker (if you’re making the signs yourself). Signs made with a pen or a sharp-pointed marker will be unreadable and won’t attract the traffic you need to be successful. Keep the content to a minimum... "Super-awesome community yard sale going on this weekend with lots of stuff for you and your family at amazing prices you won't believe!" won't translate well across the street at 45 MPH. Encourage participants to have all of their items selected, sorted, and priced a day or two before the event. Don’t underestimate the time it takes to complete those three tasks. Getting a family’s consensus on what should be sold can be time-consuming. After that, assigning a value to those things is another area where a great deal of negotiation is often needed. Make sure to have a lot of change available. Each seller will need lots of one dollar bills and at least one roll of quarters to start. If you price your items in dollar or quarter increments, then making change will be much easier. Consider designating someone as a change bank for the community (someone that starts the day with $200 or so in single bills). Whether you want it or not, the likelihood of a family or five running out of small bills or change is going to happen. Sellers should wear something to let people know they can help with a purchase. It could be as simple as an agreed-upon shirt color or, if funds and resources permit, a hat, button or an apron/tool belt that can be used to hold change and proceeds. This is a good negotiation area to get the HOA's buy-in. A blue, red or orange shirt advertising the community might just cement their involvement. Hopefully, this has helped those that are curious about taking on the role of a community coordinator and making a neighborhood yard sale happen. Community garage sales can be profitable and a lot of fun. May the sun shine for your next event!